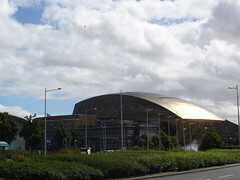 In Cardiff Bay is the Wales Millennium Centre. 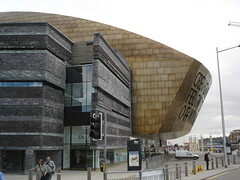 For £5.50 you can get a tour and a behind the scenes look at the building. If you’re lucky you might end up being the only one on the tour and much like the Senedd my guide was very friendly, informative and open about the centre. While larger and more extensive than Sydney’s Opera House the tour retains the same basic structure. 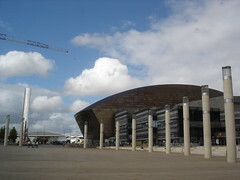 First, a walk outside to look at the construction and the range of materials used (sourced from around Wales) and then inside to look at the artwork and design elements used within. Inside you’ll be treated to a backstage look at the dressing rooms, set construction and the rehearsal spaces. 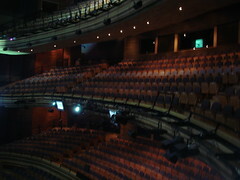 One of the final sections is a chance to sit in the main theatre. 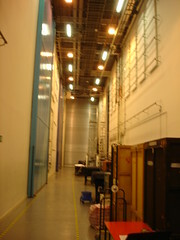 The space was designed to enhance the audio visual experience. 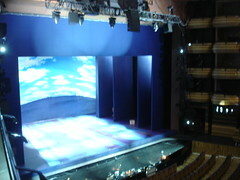 There are no columns in the space to restrict viewing and depending on the performance special screens can be lowered to influence the sound. The tour is recommended as it’s reasonably priced, only an hour and quite informative with friendly staff.